Start playing this warm, beautiful instrument and chances are good that you'll find yourself still playing it several hours later. Fender Rhodes Mk. 1 Stage Piano, Classic and Intimate Sound, Six selectable mic perspectives. Our Mark One Instrument is based on a Fender Rhodes Mk. 1 electric piano. This king of electric pianos is played through a vintage tube combo amp and captured by rare vintage mics for a sublime sound. The tone can go from a smooth enthralling caress to a searing, crunchy sound that cuts through the densest mix. The Mark One instrument is based on a Fender Rhodes Mk. 1 electric piano. The Rhodes Mk. 1 has been the most popular electric piano for more than four decades and is heard on countless hit records. Rhodes pianos can vary in sound, and this particular instrument was selected for its unmistakable warmth and intimacy. While the instrument's line output can be recorded "direct," it is often played through an amplifier to add some crunch and character. For this recording, we used a MusicMan 112 RD Fifty 1x12". Different recording setups can be mixed and matched to give you endless sound design options! With the tube combo set up in a large recording room, vintage microphones was positioned at both close and far away perspective capturing the amp close-up and with natural ambience. To add variety, three mics were positioned next up to the speaker; a dynamic, a tube condenser and a ribbon microphone. One floor and one room microphone setup were used for the option of adding depth and ambience to the recordings. In addition to the acoustical recordings, two line signals were also recorded: One "direct" through high-voltage DI box and another through the classic Roland Dimension D analog stereo chorus. 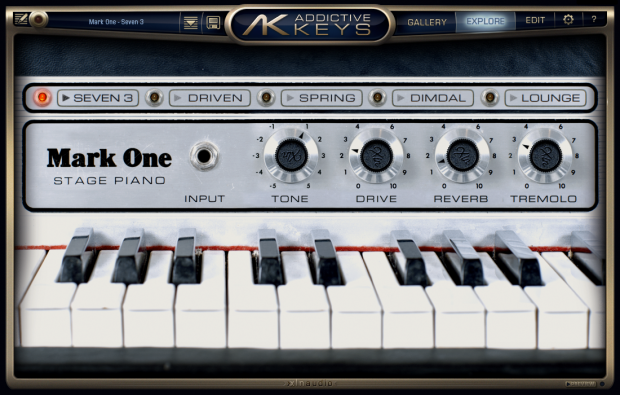 Addictive Keys brings the world's most inspiring and interesting keyboard instruments into the studios of songwriters, producers, and musicmakers. It's unique sonic capabilities, smart workflow, fast load-times, and outstanding sound quality are designed to help you stay in the creative flow and to compose great music while you're in the zone. Addictive Keys ships with tons of inspiring presets neatly arranged in "ExploreMaps." Each preset even comes with previews that present the preset in the perfect light. If you're in a hurry, you can use presets as-is so you don't lose inspiration. If you're in the mood to design new sounds, the powerful sound engine gives you great control over each instrument. You can even mix and match microphone setups! 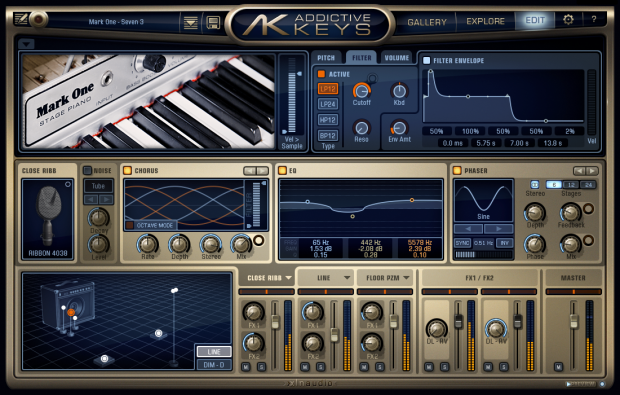 Addictive Keys works as a virtual instrument running inside your host music software. It supports all of the major plug-in formats: VST & AU (32 and 64-bit), RTAS (32 bit) and AAX (64 bit). This means you can use Addictive Drums within most music applications including: Pro Tools, SONAR, Cubase, Logic, Live and many others. Addictive Keys can also work as a standalone instrument, without requiring host music software. This makes it easy to load an instrument, find an inspiring preset, and start playing without having to launch your music software. This is perfect when you just want to play without waiting for music software or deal with routing. This is an excellent Rhodes library from XLN. I own a few others, but I decided to add this one to my collection because of the ease of adding effects and making tweaks. The Addictive Keys program is great for taking raw sounds and turning them into something unique. The presets (which you can listen to in the downloadable demo from XLN) give you a good idea of the range of sounds you can get from the Mark One.